Just enter your content and pick the case you need to change over it to. Now you can do faster for your office job / layout design. This tool can convert your text to any case. Webbit Free Convert Case online now available for Sentence Case, Upper Case, Lower Case & Title Case. You can download the text from there as well. Just click the download button it will auto download as the .txt format for you! Do you want to block visitors by country? 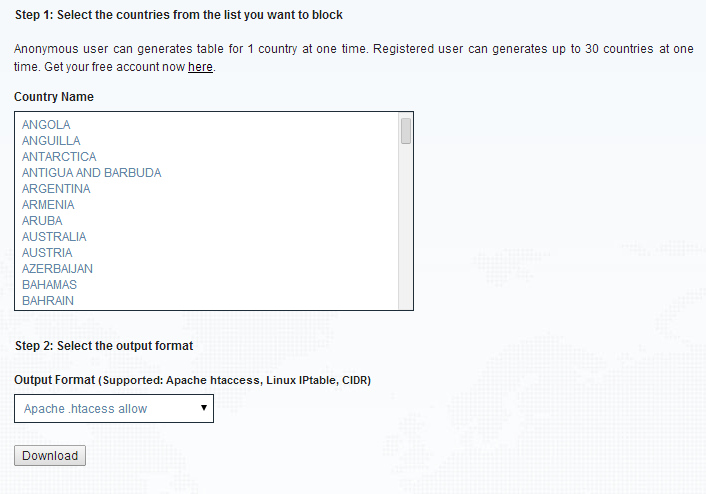 You can now block them easily with the free blocking service for Apache Web Server. Simply select the countries you want to block from your Website and press the “Download” button. Instantly, the .htaccess information is generated for you. Copy and paste this generated code into your .htaccess file and it denies the visitors from the selected country to access your Website. You can efficiently block unwanted traffic from non-converting, fraud and spamming countries you do not want to give access. If you want to block visitors in IIS Web Server, please consider the commercial edition of the IP2Location ISAPI Filter. It is very easy to use our IP block country generator.